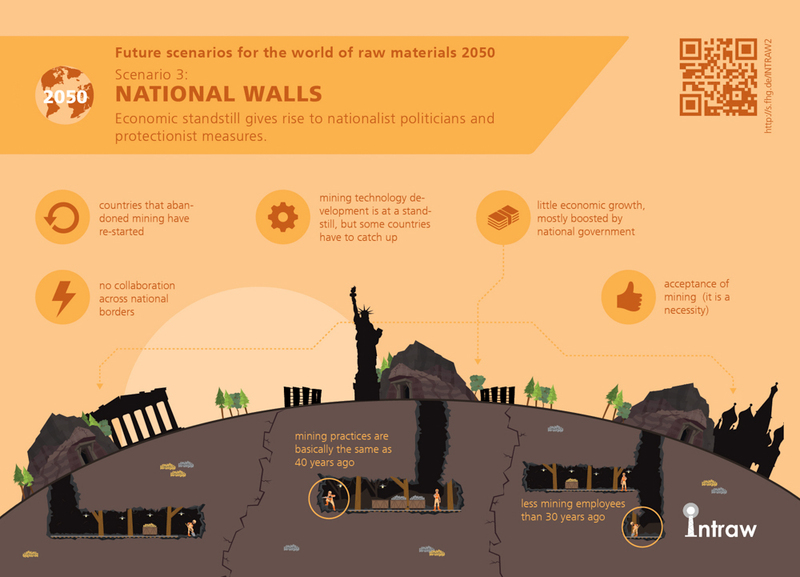 In 2050, the world of raw materials got stuck as social and demographic pressures triggered a long period of economic standstill, which lead to a rise of protectionist measures. The absence of leadership and insufficient political will didn’t help to improve the situation. Each country fights for its own agenda. There is little progress in mining practices as reforms have stalled and private investments are low. Economic standstill gives rise to nationalist politicians and protectionist measures. Conflicts related to the access to raw materials arise. International institutions are weak, they can barely settle disputes. Disparities between countries got worse, there is little economic growth. Securing access to raw materials is a major challenge, especially for the resource-poor countries. Old alliances are re-established. Nations focus on solving their own problems. They run national economic development programmes. Resource-poor countries re-start mining and invest into recycling, reuse & substitution. Resource-rich countries favour technologies that are readily available. The world‘s biggest economies find it difficult to sustain growth. They focus on solving their own economic and societal problems. Disparities between countries got worse. There is a widespread tendency towards protectionism and trade agreement are breached. We repeatedly observe conflicts related to the access to raw materials. International institutions are weak, they barely manage to settle disputes. A wave of„neo-colonialism“ can be observed. In this world, the dream of a united Europe is long forgotten. Europe is characterized by a number of blocks of countries that engage in cooperation. There is a free movement of goods (customs union) but the remaining „EU” institutions are weak, trying to balance the interests of the different geographical alliances. Global trade has stagnated during the 2030ies and 2040ies and there is a general sense of global insecurity. There is little and uneven economic development. For most countries, securing access to all required resources is a challenge. Some old alliances are re-established (e.g. USSR) to cope with shortages of raw materials. As demand for commodities stagnates, governments run national economic development programmes to boost their domestic economies. Investors don‘t know where to invest their money. Growth rates are slow and international investments are risky. Europe still benefits from an inheritance of large amounts of capital from the past. This means that although there are huge differences in the economic performance and the standard of living between the different „European blocks”, Europe is still a nicer place to live in than most other countries – this higher standard of living is strongly protected against external influence. In protectionist, resource-rich countries, mining has become an important job motor. Even countries that almost abandoned mining, have re-started. However, globally speaking, we‘ll see less mining employees than 30 years ago, due to stagnating demand. Mining has turned into a somewhat dull industry. Mining companies fall from the top 20 most attractive employers list as other industries are much more attractive. Society is ageing rapidly. In the EU, migration is limited and strongly controlled by restrictive immigration policies, aimed to protect the national workforce. At the same time, the migration pressures increase. Mining has always been a conservative industry, but with a few exceptions mining practices are basically the same as 40 years ago. Technologies that are readily available are favoured. High-tech mining and low-tech mining co-exists as countries /blocks of countries pursue their own agendas with regards to the domestic production of raw materials. Technologies for recycling, reuse & substitution are developed – especially by resource-poor countries, but at a slow pace. Domestic R&D gets a boost. Environmental permitting procedures for mining are mostly a formality, any investment that meets basic environmental criteria and generates employment is approved very quickly. Environmental policies are in place but often ignored. Land degradation continues at an unsustainable scale globally but this is met by indifference by society, whose primary focus is providing the means for survival.